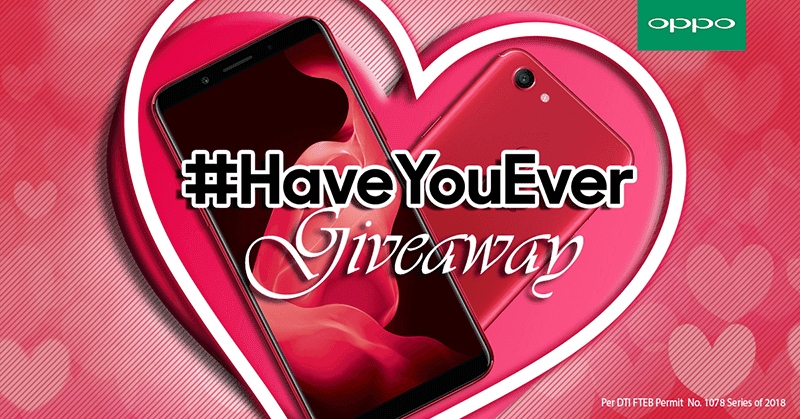 OPPO just launched the company's Valentine's 2018 promo on Facebook, the #HaveYouEver question. Every 2PM daily on OPPO's Facebook page, participants must answer by sharing their story though a video sumission. Participants may feel free to release their "hugot" everyday starting Feb 1 until Feb 14, 2018. This love month, we want to create an opportunity for our fans to express and share their hugot stories. We want to continuously become a part of their love stories and journey, and there isn’t any better way to share it than getting rewarded as well, said Eason De Guzman, OPPO Philippines' PR Manager. To join the promo, participants should visit this link and submit their full name, email address, registered address, and contact number. Then, send the video to the #HaveYouEver question for the day by telling the story to get 1 raffle entry. Just make sure that your video file size has a maximum of 100MB size (around 5 minutes) in .mp4 file. Those who will join will get a chance to win PHP 25K worth of SM Gift Certificates. More more info and the complete set of mechnics, just visit OPPO's Facebook page.